Yes… I am actually talking about Ferdinand Leopold Oyono, the Cameroonian writer mostly known for his novels ‘Une Vie de Boy‘ (Houseboy), ‘Le Vieux Nègre et la Medaille‘ (The Old Man and the Medal), and ‘Chemin d’Europe‘ (Road to Europe). I must admit that I have only read the first two. I have decided to focus only on Oyono literary achievement, even though his literary career was quite short, and he also served as ambassador and minister under different presidents of Cameroon for over 40 years. In his novels, Oyono uses satire to denounce the colonial system, the abuse Africans suffer in the hands of the European. Oyono writes ‘Une vie de boy‘ (Houseboy) as a diary, and casts a critical view on the relations between Africans and Europeans during the colonial era. The main actor is a young boy, who leaves his family where he was mistreated, and ends up with the French missionaries, and later on works as a houseboy for the ‘Commandant’; where he quickly becomes the center of querels between the Commandant and his wife, and is frequently beaten because of what he knows. In his second novel, ‘Le vieux nègre et la medaille‘ (The Old Man and the medal), Oyono evoked the deep sense of disillusionment felt by those Africans who were committed to the west, yet rejected by their colonial masters. Meka, the main protagonist, receives a medal for his services to the French colonial administration, for donating land to the French missionary church and above all for sending his two sons to the second world war where they are killed. It is interesting that despite his short literary career, Oyono has managed to write two of the most important African novels depicting the relationship between the European colonizer, and the African colonized, a relationship made up of disillusionment, abuse, modernism, education, and cohabitation of two worlds where one is imposed on the other. The British newspaper The Guardian wrote a really good article saluting this great Cameroonian and African writer. 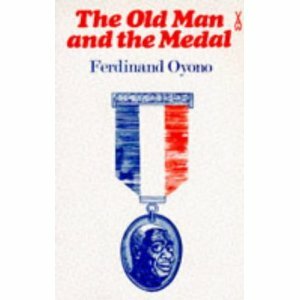 where could buy the old man and medal of ferdinand oyono in London? Several libraries such as Waterstones, or Foyles have it. Or you could try buying it online; Foyles.co.uk has it or try Amazon.co.uk or even Ebay. A great book for those that must understand their past. Its a wanderful work.A big kudos to oyono,though racism stil exist when we the africans are with ”them”. Wow this is a wonderful work, in fact i enjoy it when lecturers lecture on it in class-UB.I think you are an exceptional writer and please come up with more for our consumption. I pray for more Grace to your elbow. I wish to annouce to you that i will be more than you in a while. Thanks for thinking it possible because it has already happen. yes we are equal either white or black.thanks for reviewing this,we appreciate it. this is fact an african man must understand.that no matter the level of love we have for the whites we should nt forget our root.big thanks to oyono for this novel. Thank you Ramon, for visiting the blog. Howdy! This blog post couldn’t be ԝritten any bettеr! Going through this aticlе reminds me of my previous roommate! He constantly kept pгeachіng aboutt this. I will forward this post to him. Fairly certain he’ll have a very good read. Fаntastic website. Plenty of helpful information here. I am sending it to severаl buddies ans additionally sharing in delicious. And certainly, thank you in your effort! Wе absоutely love yoսr blog and fіnd most off yоur post’s to be ϳust what I’m looking for. Does one offer guest wwriteгs to write content in yoսr case? I wouldn’t mind creating a pοst or elaborating on a few of thе subjects ƴou write relatrеd to here. Absolutely, just write, and send it to me, then may be we could add it up as a guest feature. Wao! wao! wat a great nvelist. infact ur works are a perfect works in commonwealth studies. u raly touched d nost essential parts. d works r extrimly beautiful, esp dat of HOUSE BOY and THE OLD MAN AND THE MEDAL. courage sir, a student as a literary critic like me realy find d books nurishable to almost every aspect. i plan to becom like u and i will by God’s Grace. Thank you for visiting the blog Raoul, and yes you are absolutely right about Ferdinand Oyono’s great contributions to African literature. Please may I obtain its literal Analysis? Am so happy to read this novel bcz can explain the life of to day. Thanks… it is a good book! can I get this novel through my email?.real like to read it.